?Brilliant & Very Funny" HRH Prince William & Catherine Middleton December 2010! Steve Hewlett has performed 1000's of venues to millions of people whether it's in a Holiday Centre or on a Cruise ship, in a Theatre or on TV. As well as touring the UK in the Ken Dodd Laughter Show for 3 years Steve had the Amazing opportunity of Touring his own 45 date UK Theatre Tour 'Thinking Inside The Box' in 2014 to thousands of British families after his successful appearances on TV's Britain's Got Talent Final with his Simon Cowell creation. Steve's proudest moments were to perform on board the QE2 for its last ever Atlantic crossing from Southampton to New York. And in November 2014 attended a 125th Year Celebration of the Grand Order of Water rats where he proudly introduced his wife Nina to Her Majesty the Queen & HRH Prince Phillip, it was also the year Roy Hudd & Roger De Courcey proposed Steve into the GOWR Showbusiness order. Steve Hewlett is a Young New Innovator in the World of Comedy Ventriloquism. An International Artist who is a favourite among many Theatres & Cruise Ships Worldwide. In 2016 Steve appeared as a Guest on BBC Strictly Come Dancing, Toured the UK with American Legendary Ventriloquist Ronn Lucas, in Talent's Of Britain Nationwide for Howlin Comedy & in May with American Sax Sensation KENNY G ending the tour at London's Royal Albert Hall and Steve will be Joining The Legendary OSMONDS on the Andy Williams Christmas Extravaganza in Branson, USA & the UK in December. 2017 & Beyond sees Steve Tour a New Show Celebrating his 30 years as a ventriloquist. 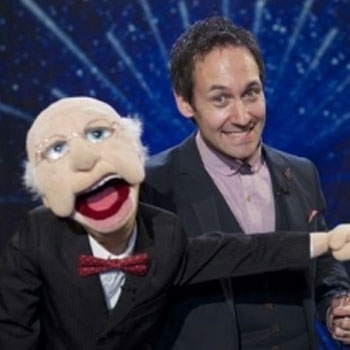 Laugh out loud at one of the UK's Best Loved Comedy Ventriloquists.